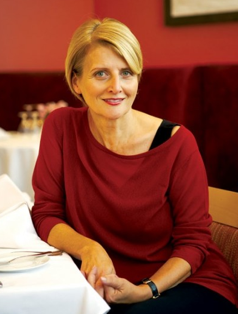 We are at #17 of the 50 Women Game Changers in Food, Dorothy Cann Hamilton. She founded The French Culinary Institute in 1984 and more recently The Italian Culinary Academy which together they formed The International Culinary Center in 2006. She has won numerous awards including the prestigious Ordre National du Mérite (National Order of Merit Award) from the French goverment. Among the Institute's notable alumni are Dan Barber, Bobby Flay, and David Chang, just to name a few. A powerhouse in the culinary world....she is truly a Game Changer! As a tribute to this week's icon, I chose Pan-Roasted Salmon with Soy-Ginger Glaze a recipe created by one of the instructors at the FCI, Chef Bobo. It was not only delicious but healthy too! (Recipe below as it appeared in Food & Wine's January 2005 Issue). Preheat the oven to 350°. In a small saucepan, combine the soy sauce and ginger and bring to a simmer. Remove from heat and stir in the honey and mustard. Heat the olive oil in a large nonstick ovenproof skillet. Season the salmon with pepper and add it to the skillet, skinned side up. Cook over high heat until golden and crusty, 2 to 3 minutes. Turn the salmon and spoon the ginger-soy glaze on top. Transfer the skillet to the oven and bake the salmon for 5 minutes, or until cooked through. Using a slotted spatula, transfer the salmon fillets to plates, garnish with the cilantro and serve. Looks wonderful - simple and healthy! Finding recipes that reflect DH's attitude and interests was an interesting feat this week! Everyone has, so far, had a different spin! This blogshare has been really fun to participate in! See you next week! Thanks for this recipe, Martha. We eat so much fish, and yet I rarely cook it with strong flavors. This will give me some needed variety. I'm loving all the healthy recipes we found for our game changer this week. Must be so difficult for her! Bad enougb for us! 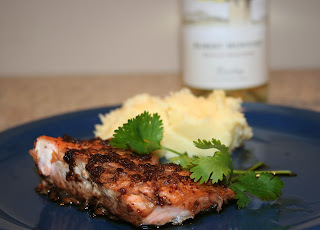 Your salmon looks wonderful...salmon is my favorite and I'm always looking for different ways to serve it...very nice post! Never got mine made this week...too many things going on! Glad you are joining us for FFWD....Welcome! Love this healthy dish that Chef Bobo created for Dorothy Hamilton - thanks for sharing it. Looks super yummy! I miss salmon since I moved to the east coast. That glaze sounds just perfect for the salmon! What a great dish!